Unique mixture of nutrients and herbs selected for their ability to help the body increase metabolic rate, improve solubilty, manage appetite and sugar cravings. 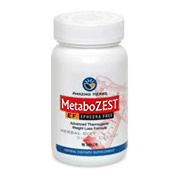 Discover the MetaboZEST EF difference... developed by leading experts in the health & nutrition field, it combines some of the most powerful and effective natural ingredients for weight loss plus a unique mixture of nutrients and herbs selected for their ability to help the body increase metabolic rate, improve solubilty, manage appetite and sugar cravings, and facilitate carbohydrate metabolism. Advance thermogenic agents in this formula help the body maintain a high metabolic rate - converting food into energy. As a dietary supplement for adults, take one to two tablets 30-45 minutes before breakfast and lunch with 8 oz of water. Warning: Do not use supplement if you have any allergies to Shellfish. Each tablet contains: Vitamin B6 (pyridoxine hcl), Iodine (from kelp), Chromium (amino acid chelate), Guarana (33% extract providing 100 milligrams of naturally-occurring caffeine), Theobromine, Yerba mate extract, Green tea (98%/45% EGCG), Garcinia cambogia (50% HCA), Chitosan, Gymnema sylvestra, Banaba (1% extract), Calcium pyruvate, Apple cider vinegar, Grapefruit powder, Coleus forskohlii (powder), White willow bark (powder), Uva ursi (powder), Juniper berries (powder), Bechu leaves (powder), Cayenne pepper (powder). Other Ingredients: Magnesium stearate, stearic acid, microcrystalline cellulose, and peppertmint oil. MetaboZEST EF is shipped in a discrete, unmarked package. Orders are processed immediately and usually take about 3 to 5 working days to be received. We do ask that you try it for 2 to 3 weeks to feel the full effects. Any information received is used only for order processing and shipping purposes. Your information, such as e-mail address, will never be disclosed to a third party.